And while the bomb was being invented, babies were born, friendships were forged, children grew up, and Los Alamos gradually transformed from an abandoned school on a hill into a real community: one that was strained by the words they couldn’t say out loud, the letters they couldn’t send home, the freedom they didn’t have. But the end of the war would bring even bigger challenges to the people of Los Alamos, as the scientists and their families struggled with the burden of their contribution to the most destructive force in the history of mankind. 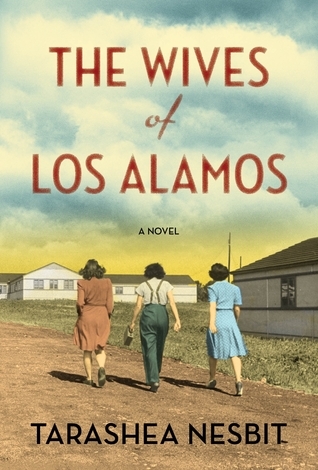 The Wives of Los Alamos is a novel that sheds light onto one of the strangest and most monumental research projects in modern history, and a testament to a remarkable group of women who carved out a life for themselves, in spite of the chaos of the war and the shroud of intense secrecy. At first the book was a little strange to me because the author wrote it as a group. and used “we”. An example is “we came from New York, or we came from Nebraska or we came from Hamburg”, or “we wanted new stoves, or we wanted to go shopping, or we wanted to be able to spend more time with our husbands”. After a while I got used to that syle of writing and it didn’t bother me. The book, while maybe not exactly as it happened, was a great story, a quick read, and one I really enjoyed. 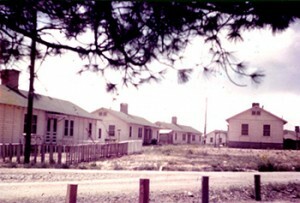 I can’t imagine what it was actually like for the men, women, and kids living at Los Alamos. Being cut mostly cut off from the rest of the world for 3 years couldn’t have been easy. I think the hardest part for me would have been not knowing the reason for them being there. Everything was such a secret and that would have bothered me a lot. 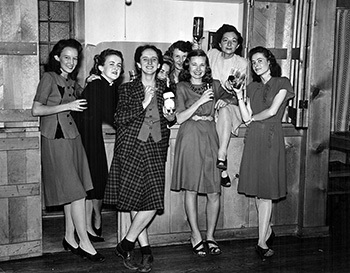 I loved reading about the friendships that developed between the women, and was glad to know they did have dances etc. to make their time there a little easier. Once the project was over, I imagine everyone had mixed feelings about leaving. On one hand they had to be happy to be “free” again, but on the other hand they were probably very sad to leave the people they had come to depend on during their stay at Los Alamos. Also, I wonder how many of the women, men and children had a hard time coming to grips with the reality of what their stay there meant. Overall this was a very good read and I learned a lot since I’d never really heard anything about what it was like for those who lived there. I think this is a book anyone could enjoy, if you can get past the collective “we” narration. Yeah, third person plural narration can take some getting used to. This sounds similar to The Girls of Atomic City, which I loved, so I’d like to give it a try. I haven’t heard of The Girls Of Atomic City, I’ll have to check it out! I think this sound great, I’m checking it out, thanks. If you do read it, I hope you enjoy it as much as I did! I don’t think that the ‘we’ narration would bother me too much … I never really tend to even register the narration style of a book. I know that we had plenty of secret installations and military bases of our own, here in the UK, the most well known of them being Bletchley Park`, where the wartime codebreakers were housed …. Whilst I am interested in this period of our hsitory, it would depend on the mix of fact and fiction, as to whether or not I would be likely to enjoy a novel about the place, so I am guessing that my feelings would be pretty much the same about ‘The Wives Of Los Alamos’. Terrific review, Vicki! It does sound like a good read. The “we” narration would take a while to get used to for me as well. OOH this actually sounds wonderful – right up my alley but I can see where the “we” would be odd. It took a bit to get used to the “we”, but soon it became “normal”.